Part of pet proofing the home to create a safe environment for your new companion is finding a fool-proof way to hide cable from your pets. 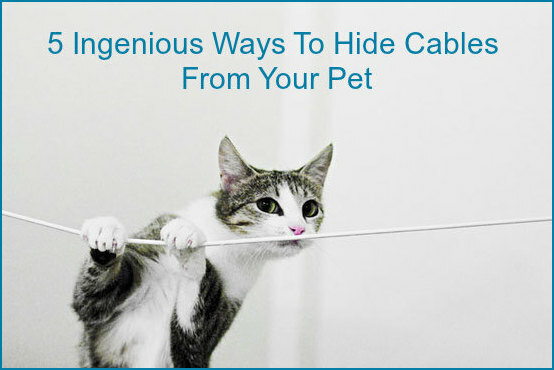 Here are some ingenious ways to keep both the cable and your pets safe and secure. Maisie Maud Broadhead came up with the ingenious idea of creating 'cable drawings' to keep cables out of reach of pets without completely hiding them from site. So think of ways that you can use your messy cables to decorate your home. Depending on how long the cable is, you can create a really interesting design with the use of your own cable and some cable clips and thumb tacks. Consider printing a design template to play around with before you commit your cable wire to the wall. Cats, dogs, and most other pets won't be able to chew on cables and wires if they're out of reach. I really like the ONME Multipurpose Cable Clips because they are functional and stylish. They are also adhesive backed, so that makes them easy too! And you can use them on walls or furniture in matching or contrasting colors. Some good quality spiral cable wrap like the Vaisis Spiral Harness Wrap can house numerous cords and keep them hidden and safe from potential pet damage. 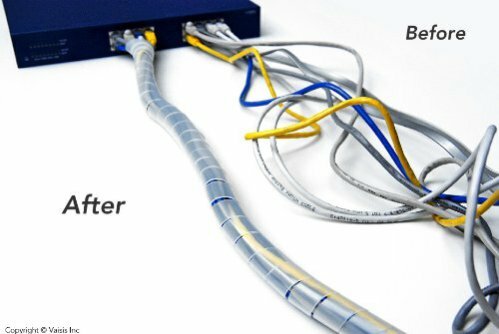 Spiral cable wrap will keep wires tightly bundled to stop them from getting tangled and the hard plastic will help prevent chewing and scratching problems. They typically come in a several colors to match your decor or to make a fun statement. Rain gutters are great for other uses besides managing rain and they can be a fantastic cable management solution. 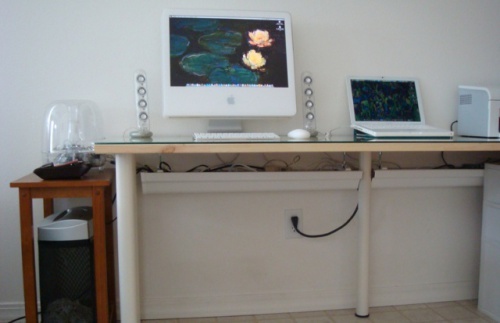 A rain gutter can be attached to the bottom of a table or desk, towards the back, and attached to the underside of the desk with hangers, end caps, joiner nuts or fasteners. This will provide a barely noticeable, clean looking way to keep the cords hidden away from sight and safe from potential damage from pets. You can find detailed instructions on how to create your own gutter management system on Lifehacker. With these clever ways to keep pets away from your wires and cables, both your pets and cords will be safer. Have you found any clever ways to hide wires? Feel free to share in the comments section below. KatKabin: Your Kitty’s Vacation Home!